The invitation was in Helvetica. So were the modernist birthday posters and the gift book printed for the occasion. 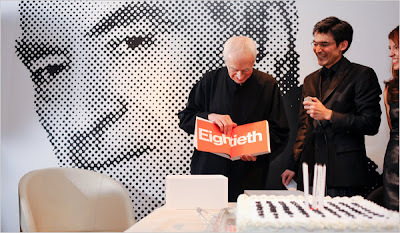 Such fealty to a font is to be expected when the honored guest is Massimo Vignelli, the graphic designer known for the 1972 New York City subway map, among other iconic designs. He turned 80 on Monday and, to celebrate, 200 of his friends organized a surprise party at the SoHo showroom of Poltrona Frau, the Italian furniture company.